It’s hard to imagine living in the same house for 29 years without making some changes to the decor, and yet that’s precisely what the Simpsons family has been doing. It’s hard to imagine living in the same house for 29 years without making some changes to the decor, and yet that’s precisely what one famous family has been doing. 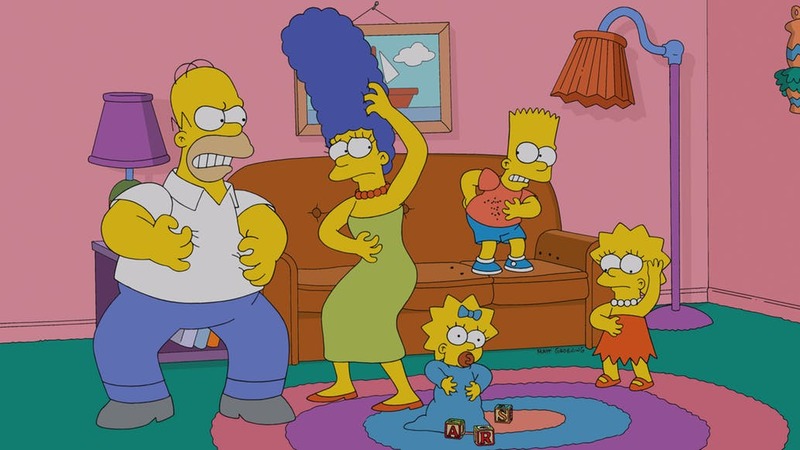 The loveable Simpsons family has been screening on our televisions for over two decades, and while characters have come and gone, the living room stays as much the same as Marge’s iconic blue beehive. The Home Advisor has taken the purposefully understated and straightforward design premise of our favourite cartoon family’s home and performed a makeover worthy of the best renovations from Grand Designs. This glamorous redesign is based on Hollywood regency, a style from the 1930s that epitomises elegance and glamour. The black and white colour palette pops with the addition of vivid blues, pinks and greens, and represents a scale of grandeur akin to the Great Gatsby. 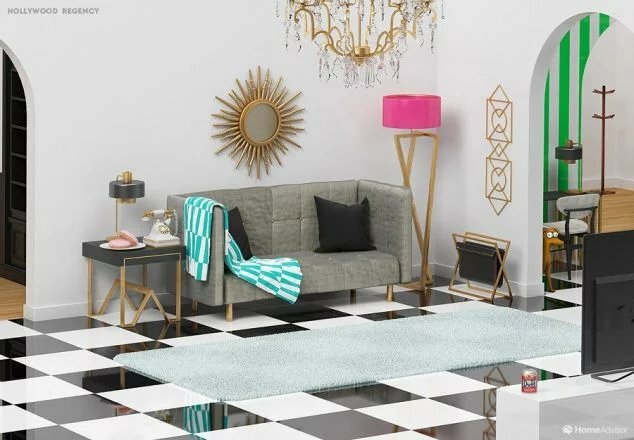 While this style may be out of place in Homer’s blue-collar world, you can achieve this look by selecting bold, statement pieces such as the black and white floor tiles and pairing it with delicate accents like a gilded mirror and delicate gold wall decoration. Look carefully, and you will see Santa’s Little Helper and a can of Duff beer — but these will be the only immediate similarities between this reimagined version and the original Simpsons lounge room. Mid-century modern design styles, similar to Germany’s Bauhaus, are all about minimalism, and yet this playful rendition introduces a more colourful palette than usually found in true minimalist design. Mustard yellows and greens thread throughout the space unified by clean lines and functional furniture. Out of all the Simpsons family members, Lisa the jazz-loving animal-activist, is the most likely to enjoy a Bohemian decor. 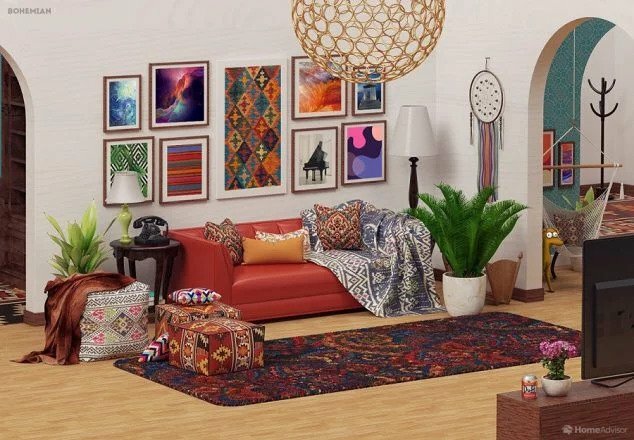 Boho interior design is characterised here by throws casually draped on the couches and chairs, eclectic artwork walls and a mish-mash of patterned fabric. For a similar look in your own home, think: Moroccan inspired colour schemes and rich Subcontinent textiles — these are boho defined. 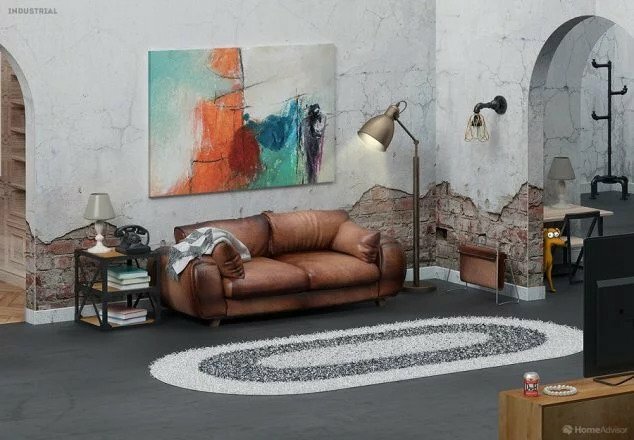 If Bohemian suited Lisa, then Homer would feel like he has brought his work home with him in this Industrial-themed makeover. Industrial interior design has been around since the early 20th century, making reappearances time and time again. You will notice many homes in Melbourne favour the industrial look which is all about exposed brickwork, untreated wood and metal. Mid-century furniture combined with a warm colour palette contrasts the rawness of exposed materials, effectively softening the look for a more comfortable version. 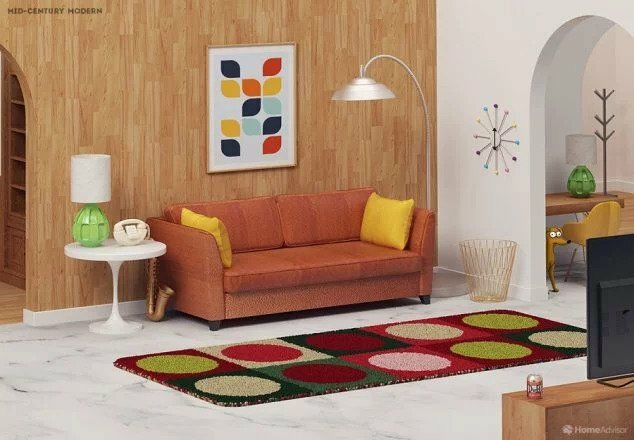 This rendition of the Simpsons living room may remind you of the time Lisa’s ‘cool’ friends decorated the family’s car in unwashed seashells, as a well-intentioned send-off at the end of their vacation at Flander’s beach cabin. Like the Simpsons, you don’t have to live by the beach to appreciate a nautical decor. The key to coastal interior design is to choose materials in sympathy with coastal surrounds. Use blues, greens, sand and earthy colour palettes and keep the design simple. It’s pretty impressive to see how a space so familiar can look completely different with just a fresh interior design approach. Inspired for your own apartment makeover episode?